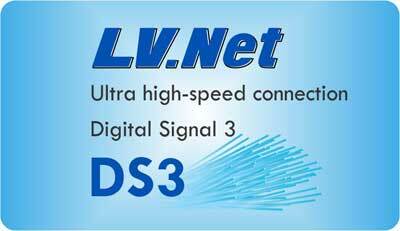 A Digital Signal (DS3) with the data rate of 45 Mbit/s is provided by LV.Net in Las Vegas. Get your high speed DS3 and faster speeds from LV.Net, DS3 Internet service provider. DS3 speeds are up to 45 Mbps and cheapest in Las Vegas. Do you need greater bandwidth than that provided by T1 access? Use DS3 for Internet access, voice applications, point-to-point networks, and VPNs. Provides larger data streams and increased performance. Get DS3 from high speed Internet service provider LV.Net in Las Vegas.